Are the days of floorstanders and separates numbered? Breaking Fad In case you hadn’t heard, someone has ripped up your pappy’s hi-fi handbook. Seismic shifts in just about every area of music technology have fundamentally changed the way we use home entertainment. Kenwood audio from 1976: traditionally separates would be swapped out over time but is old school hi-fi now due for retirement? The once hot items of the noughties – Blu-ray, AV receivers, all-in-one systems – are now on the slide. Meanwhile, sales in network media players, soundbars and Bluetooth speakers are booming. 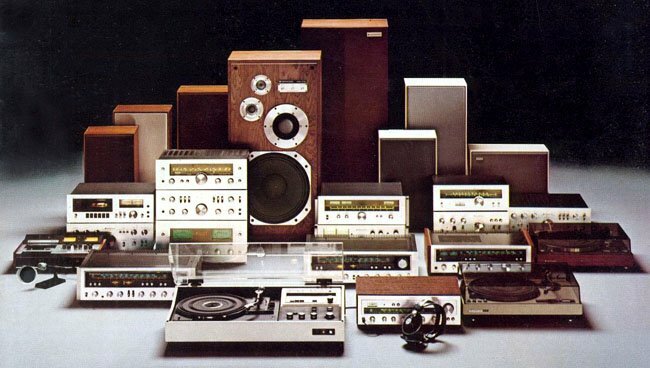 The pace of change has left traditional hi-fi and AV companies reeling. This is all good news. Audio technology is suddenly interesting again. There’s nothing new about such evolution. Few complained when the gramophone begat LPs, and compact cassettes gave way to CD. The difference now is that change isn’t being driven by fixed formats, but by content subscriptions services and file downloads. This year Spotify alone will have 30 million paid subscribers, a leap from 10 million in 2010. 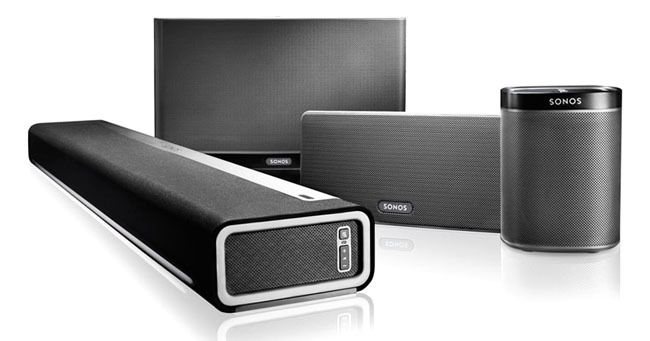 And the biggest category in audio hardware now is "multi-room", a sector created by Sonos. At a recent European conference organised by the D+M Group, owner of Denon and Marantz, CEO Jim Caudill dispensed some titbits about this new multi-room consumer. They’re typically aged between 35-45 and almost all subscribe to a music service (94 per cent). The majority (60 per cent) became multi-room converts after reading about the technology online. And if you’re curious about just how many rooms actually constitute a multi-room system, it’s apparently 2.8. Caudill’s revelations were a preamble to Denon unveiling its own multi-room system, dubbed HEOS, which launches in August. It’s very much being touted as a Sonos killer, albeit a reverential one. The line-up will comprise the £249 HEOS 3, the larger HEOS 5 (£349), and the top-end HEOS 7 (£499) which offers considerably more wallop. Unlike the Sonos MESH network, HEOS is built upon standard Wi-Fi (2.4/5GHz). We’ve seen some of the CE brands launch comparable wireless systems, but this is the first time a classic hi-fi major has committed heavily to wresting lost ground back from Sonos. The HEOS system will play music services such as Spotify, Deezer and internet radio from an accompanying app in either single or multiple zones simultaneously, and is DLNA compliant. There are also local inputs for aux and USB. 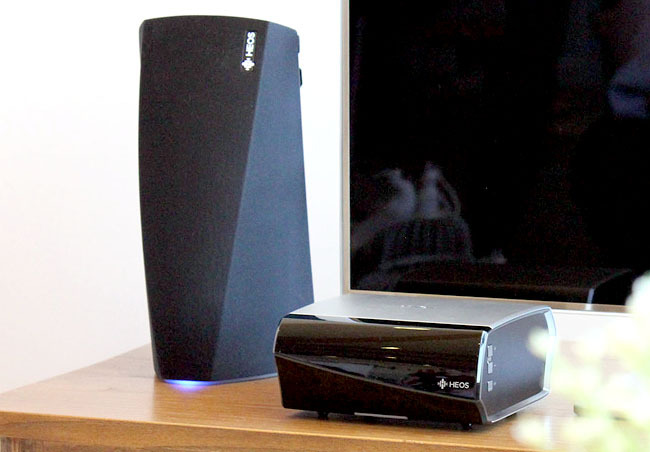 If you add a thumb or hard drive to any of the speakers, you can play back the content across the entire HEOS network. Joining the table top trio is the HEOS amplifier, which will turn any conventional speaker into a HEOS acolyte, and a HEOS pre-amp which allows sundry local sources to be connected, be they a music player, Sky+ HD box, or the TV itself. I didn’t get to make an assessment on sound quality at the event, but the brand did claim that the synchronisation between HEOS speakers is significantly better than its rival. Where the HEOS platform becomes particularly interesting is when Denon starts to build it into its AV receiver range as well as soundbars and soundbases. Expect that to happen within a year.